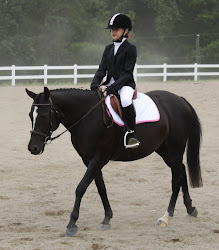 Please pray for a full recovery for Olympic Dressage rider Courtney Dye. She suffered severe head trauma this week after a fall and is in a coma in ICU in Palm Beach, FL. The horse just tripped over his own feet - not a crazy, out of control horse. This type of accident can happen at any moment, so PLEASE WEAR YOUR HELMET AT ALL TIMES WHEN RIDING and inisist that your children always wear one as well.